This red filter is ideal for strong contrast improvement since it absorbs green and blue completely and enhances red. Clouds are dramatically improved almost to the mood of a thunderstorm. It is more effective in cutting through haze, and moonlight effects are easily accomplished. It is also suited for infrared photography. Multicoated to minimize reflection at the filter surfaces which reduces flare and ghosting. Box Dimensions (LxWxH) 4.331 x 3.543 x 0.472"
77mm Red #25A (HMC) Multi-Coated Glass Filter for Black & White Film is rated 4.8 out of 5 by 6. Rated 5 out of 5 by Anton from This is not my first I shoot Black & White, even with my digital cameras. There is no substitute for a colored contrast filter for adjusting/manipulating the rendering of similarly reflective but differently colored objects in a B&W image. Since I began in photography, this filter has been my preferred brand. Rated 5 out of 5 by Jeffrey from Excellent filter for B&W landscapes If you are looking for dramatic contrast between open sky and clouds, the classic approach is to use a Wratten #25 deep red filter, originally part of a three-filter set used for color separation. Hoya's #25A filter improves on the older version, with somewhat greater and flatter transmission in the reds above 600 nanometers. In practical terms, this makes the filter slightly more efficient, enhancing the contrast between reds, versus greens and blues. 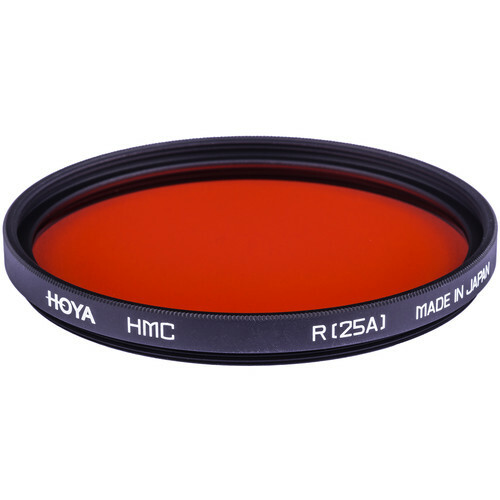 This Hoya filter has excellent coatings that minimize reflections between the filter and front lens element, keeping the image free from ghost highlights. The ring is finely machined, and screws onto my lenses with a perfect fit. The only thing that disappointed me wasn't the filter -- it was the plastic package. I really liked the round containers that opened with a twist; the square flip-up box doesn't give me as much confidence that it won't accidentally pop open. This Hoya filter is not the most expensive example of its type -- you can spend quite a bit more -- but I would be hard pressed to find a reason. I'm extremely pleased with the performance and the value. Rated 5 out of 5 by TTBphoto from Works well. Seems sharp with my IR converted D7000 It seems to have a good build quality. Not too thick. The recorded spectrum on my converted D7000 is nice for false color IR work. Rated 4 out of 5 by Don from Hey! It's red! Use these for B+W Landscapes. Haven't really exercised it yet, bot seems like good quality in test shots. Is there a density or other functional difference between a red 25 and a 25A filter, or is it just a different Wratten designation for the same thing? Sorry, can't help, just don't know. Does the filter fit the Mamiya Sekor C 90 mm f/3.8? You shouldn't have any problems with this combination.